Just tried to migrate over to smartthings. Realized is is defiantly automation first. Very robust with automation but nothing for security is baked in. You have to bake those cookies yourself. In order to get Smartthings to do security, you have to install someone else’s code. If you like doing things like that, Smartthings is for you. If you want turn key security Smartthings isn’t the system for you. The only way smarthings will work as a security system as turn key is if you get the ADT hub. And only then will you be able to add 5 ADT security devcies. That is what i have found. The only way the system will alert is if any of the adt things triggers. Or you can fo IFFT to get the 2 hubs to talk. But again thats not turn key nor reliable enough for my family. Neoleo, Where are you hearing that Samsung might abandon the field? Do you mean the Smartthings/home automation field or the professional monitoring field? Scout is the monitoring service. How do you arm and disarm without keypad or keyfobs? Use your mobile device with Geofencing? Also you have to instal an app into smarthings control consol to get alarm functionality. Has security features. You can add sirens and all that. It is done through the dashboard though, the first tab in the app. Okay omly thing i could find was i needed to install a 3rd party app. Will take mine back out of the box and take a look. still unsure how to arm or disarm without the app. Those options might not show up if you don’t have contacts, motions, etc paired, can’t remember. I could do mine with Life360 if I didn’t want to buy a fob, but they have those also. I had to install this thrid party app to get that functionality. I think there might be a device handler for the iris keypads, I will have to give it a try when I get home. I use Life360 with my family so that makes it really easy to disarm when someone gets home. I made the transition over to Smartthings yesterday. For our purposes, it checks most of the boxes for security. I was able to get the keypads up and running in about 5 minutes. Adding the "code" is just a copy/paste situation... although you have to do it for 2 different items (DTH and SmartApp). Can you explain in detail how you did your keypad.Where did you get the code? Third, adding a SmartApp or DTH (Device Type Handler) is really easy. Access the developer page, and at the top are My Smart App and My Device Handlers. Take the code for the SmartApp and DTH and copy it (there is a GitHub link for each at the link above). Head over to either the SmartApp or DTH and add new. Then select the tab From Code. Paste in your code. Say Ok. Then hit Save, then publish icon on the top right, and publish To Me. The only other thing I had to do with my first keypad was AFTER pairing, I had to manually change the DTH of the keypad itself. From that same developer menu, select My Devices, then edit at the bottom. There is a pull-down for device type, and the custom ones you add are at the very bottom of a very long list. The additional keypads automatically chose the right device type. One thing to note is that I *think* you can somehow link the keypads together with another SmartApp so that PIN codes are shared among them (I think they call it the SmartAlarm SmartApp on the link above). I chose not to do this and just configured each the same way (my name and my code, my wife's name and her code) for each individual keypad. The program does give other great options like the ability to "burn" a pin once it's been used - something you could set for a repairman or what have you. I should point out that in no way shape or form am I technically savvy, but this process was actually really easy. When the "alarm" is armed from the App or from the proximity sensors (mine turns on when my wife and I leave) the keypads accurately reflect the state of the alarm... I thought that was a nice bonus. Seems like a lot of things that could break. Cause aggravations down the road. Thanks ,I'll give it a try .That was perfect info! 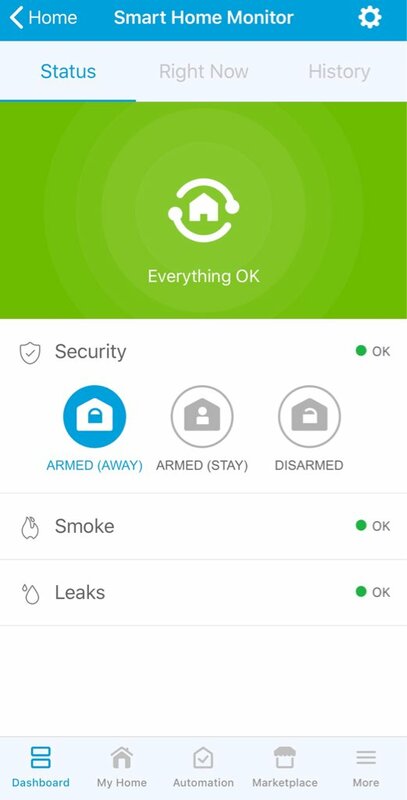 I use Geo Fencing to arm and disarm via the SmartThings App so I don't have to remember to click a button each time, I tried a few presence sensors but the battery life was very short, phones work well as long as your willing to give the people who will be coming and going access through the app, otherwise you can use the Life 360 integration to avoid giving access to the app. The only way smarthings will work as a security system as turn key is if you get the ADT hub. And only then will you be able to add 5 ADT security devcies. I've seen this limit mentioned before, but I thought it sounded unreasonable... Very few homes could be fully secured with 5 sensors. From what I've read, the limit is 64, which seems to be a much more reasonable limit for most homes. Is this with the regular Smartthings or with the ADT version? Its also available in either the new or classic apps. I had issues with the ST SHM getting false alerts etc but it was because I was using both classic and new apps. From what I can tell the SHM in the new app has no linkage to the classic app. I just use routines to set SHM in the classic app based on presence and it works perfectly. No need for a keypad it just works. Stay away from using the new app, it will mess up your scenes and they won't work right in the classic app. Also the new app is missing routines which is required to use presence to arm and disarm SHM automatically. I also use the button at night to arm SHM and in the morning to disarm it via routines. I'm liking ST way better than Iris. You can set it to trigger lights and set the color to red for example and even set the brightness level which you couldn't do with Iris.